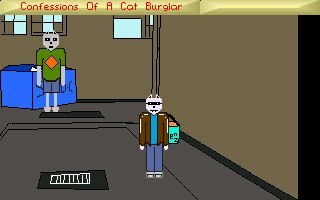 In this game you play the role of Frank who is a cat who just happens to be a burglar. He gets caught by the police and tells them about one of his jobs. The game is viewed like a flashback with frank talking in the past tense. The game feels a little rough around the edges, but the puzzles are good difficulty, and that is ultimately what makes the game worthwhile. The talking in the past tense (since the main character is telling a story after the fact) works quite well. Could have done with more feedback for some of the puzzles. e.g. If you just try using the stick on the door or it's parts.